San Diego, CA (November 27, 2013) – Everyone knows beloved Twilight Sparkle and her best friends, but have you ever wanted to know what the other ponies in Equestria are up to? Starting in January you will get a chance with the new ongoing comic series My Little Pony: Friends Forever. This collection, based on the animated hit series, My Little Pony: Friendship is Magic, airing on the Hub Network, will be made up of one-shot stories that focus on different pairs of ponies getting into various hijinx and will feature a mix of new creators as well as old favorites. 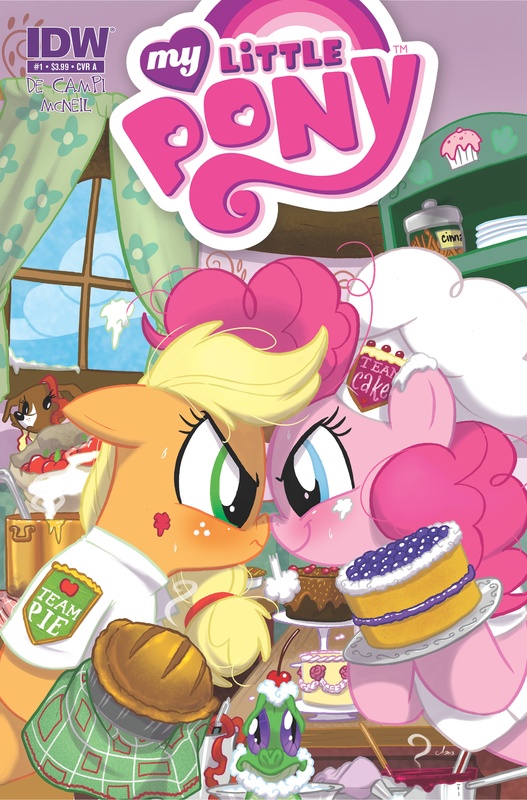 The first pony pairing will feature the loveable Applejack and Pinkie Pie in “The Pie’s The Limit” by two noted authors, Alex de Campi and Carla Speed McNeil. When these two ponies enter a baking contest they will learn more than just what it means to be the best at something but also what it means to be a friend. Alex de Campi works in various art mediums from film to comics and is known for her work on IDW’s Smoke, which was nominated for the 2005 Eisner for Best Limited Series. Carla Speed McNeil is a multiple Eisner Award nominated writer and artist, best known for her science fiction comic series Finder.